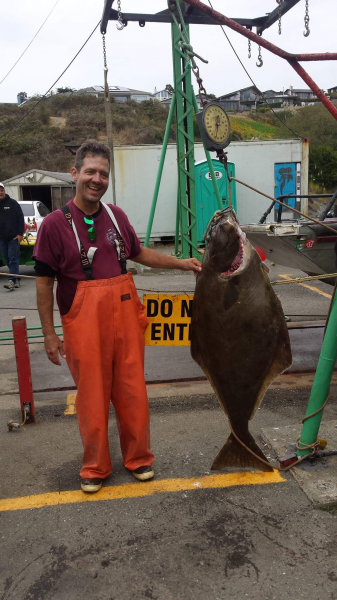 Given the times, and the tools available, the oldest records of California halibut fishing primarily deal with commercial catches. But they do provide some evidence of how many fish once roamed the California coast. As early as the 1870s there were sailing vessels transporting iced halibut as far south as San Francisco. The fish originated chiefly from small fishing boats out of Port Townsend and Victoria. By the 1880s a small fleet of two-man sailing vessels were built that supplied halibut to various West Coast markets, though this was primarily in British Columbia. Ultimately in this era the halibut business all up and down the coast failed, primarily because ice was often hard to obtain, and the cost and reliability of shipping long distances made the effort too risky. Many of the boats shifted to hunting seals. In 1895 the vessel More became the first to install a gas engine. By about 1900 most of the fishing vessels were centered out of Seattle, all the boats had installed at least a small auxiliary engine, and it became much more likely that fresh fish could be delivered to market. Early records of landings in California are scattered, and sometimes difficult to compare with today’s records. The records that do exist rarely deal with sport fishing. From 1911 through 1915 California and Oregon combined are estimated to have produced on average about 300,000 pounds of “eviscerated, heads-off” halibut annually. It should be noted that these records are based more on where the fish were offloaded, than where they were caught. The CA/OR catch rate about tripled by the early 1930s, then gradually declined back to about 300,000 pounds by the early 1960s, and finally settled into an annual landing of about 100,000 pounds per year for the two states combined. Compare those numbers to ports in Washington, British Columbia and Alaska which each routinely produced 2-million pounds annually, and it’s clear Oregon and California combined were not a serious part of the harvest. And still, records dealt with where fish were offloaded, not where they were caught. In many cases the success of particular ports was based as much on the presence of railroad lines as anything else, and didn’t necessarily relate to the presence of fish. Trinidad fisherman, “Mo” caught this 95 pound Pacific halibut on the last day of the 2016 season. California-specific records go back as far as the mid-1920s. The only two California ports with substantial documented halibut landings at that time were Eureka and San Francisco. Other local ports with intermittent commercial landings were Crescent City, Trinidad, Fields Landing, Shelter Cove and Albion. California’s 1926 – 1930 records show an average of 464,000 pounds of “eviscerated, heads-off” halibut. The harvest peaked in the 1931 – 1935 Great Depression era, with an average of 725,000 pounds per year. Annual landings then rapidly declined, till by the early 1970s they were averaging only 20,000 pounds per year. The “catch” is the way these harvest numbers were compiled. There were two basic errors built in. First, the vessels were not required to reveal where the fish were caught, and it was fairly common for boats from Washington or BC to head south if they could sell for a higher price (particularly if the fish were illegally caught further north). Second, and particularly affecting the San Francisco records, was the fact that no distinction was made between Pacific halibut, and California halibut. In the mid-1800s there was already a strong commercial fishing presence in and around San Francisco. The area had four salmon canneries, a large crab and paranzella net bottom fishery, a San Francisco Bay shrimp and sturgeon fishery, and various codfish boats that fished the Bering Sea. There are records of Pacific halibut taken near the Farallon Islands as far back as 1855. Annual landings in SF are not believed to have ever exceeded about 250,000 pounds. By the 1850s, Eureka was primarily a logging community. Nevertheless, by 1857 there were two primary commercial fishing communities. There was a substantial Humboldt Bay-based shark-oil and dried fish operation, and Dungeness crab dominated the overall offshore commercial fishing effort. Eureka was connected to the Bay Area by rail in 1914, and by 1923 a modest local Pacific halibut fishery had developed. Prior to that time, halibut were mostly an off-season catch for the salmon trolling community. Operations were considered hazardous due to the fog and dangerous bar crossing. The peak year locally was probably 1934, when over 750,000 pounds of halibut were delivered to California, mostly through the Eureka ports. Again the weakness with the numbers is that they don’t indicate how much of that catch was from local waters. Thereafter, the catch declined rapidly, and most of the halibut boats went out of business by 1940. Fishing seasons were belatedly shortened, but it was clear that the offshore banks had been over-fished. By the late 1940s, nearly the entire California catch came from about 20 small boats using set-line gear. 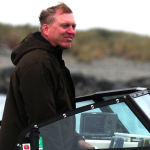 The remaining few fish were taken by about 200 even smaller vessels between salmon trolling seasons. By the late 1960s, there were no more halibut-specific fishing boats left in the Eureka area. If you are interested in a much more detailed history of Pacific halibut, obtain a copy of “The Pacific Halibut, The Resource and the Fishery” by F Heward Bell, former Director of the International Pacific Halibut Commission. His book includes historical photos and stories of many of the early fishing boats, the commercial fishing history, incidental catch fisheries, and international agreements which affect us.